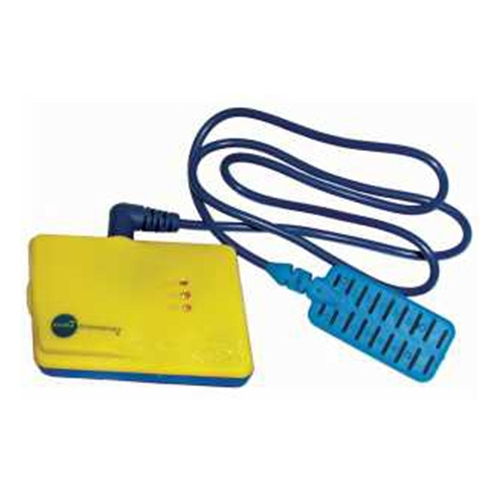 Urocare Dri Sleeper Excel Bed Wetting Alarm from HealthyKin.com has many unique features not found in other alarms. It's not usual to consider bed-wetting a problem until after the age of 5. Most bed-wetting is genetic – it runs in the family. A typical bed-wetting pattern is: very heavy sleeping and producing too much urine at night. Cutting down drinks in the evening makes no difference - it just makes for a miserable child. The alarm unit goes on the shoulder and the sensor goes in the underwear. When the sensor is wet with urine, it triggers a loud alarm to wake the child. Over the next few days or weeks, your child begins to learn to wake more and more quickly until he/she is beating the alarm and waking before bed-wetting starts. The pattern then becomes waking up every time he/she needs to go to the bathroom. Then the final stage begins; your child will sleep through the night but without wetting the bed or needing to wake up to go to the bathroom. This is the mature pattern, your child is capable of waking if he/she needs to go to the bathroom and even more interesting, it now appears that the over production of urine has stopped. Dr Anthony Page, PhD invented and perfected the DRI Sleeper® bed-wetting alarm treatment. For over 30 years Dr. Page has been treating bed-wetting, and the DRI Sleeper® was developed from that experience. When you choose a DRI Sleeper®, you get the best, and all of Dr. Page's personal experience built into one little box. Packaged: 1 DRI Sleeper® with one Urosensor® per box.